Description: The Deuteronomistic History includes a host of workers who harvest and glean, fetch water and cook, spin and weave, heal the sick and much more. The mostly anonymous women who performed this work for others are sometimes mentioned only in a single verse. Consequently, they often are as unrecognized in modern scholarship as they seem in the biblical text. To help readers appreciate the place that these workers played in their ancient socio-economic and literary contexts, this work examines the key texts in the Deuteronomistic History that mention women in service occupations: slaves and dependents, cooks, wet nurses, childcare givers, prostitutes, and scribes. In the process, readers will discover, perhaps surprisingly, that these women were honored not in relation to matters such as sexual purity or marital faithfulness but on account of the valuable service that they provided. Citation: Susanne Scholz, review of Mercedes L. Garc�a Bachmann, Women at Work in the Deuteronomistic History, Review of Biblical Literature [http://www.bookreviews.org] (2013). 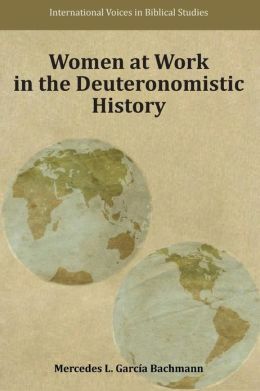 Citation: Ralph K. Hawkins, review of Mercedes L. Garc�a Bachmann, Women at Work in the Deuteronomistic History, Review of Biblical Literature [http://www.bookreviews.org] (2014).